Join us for a night of theater in the Beacock Music Recital Hall! In the tradition of the hilarious Harvey Korman and Tim Conway sketches from the old Carol Burnett Show, comes the stage comedy The Queen of Bingo! 'Sis' and 'Babe,' two sisters on the other side of 50, want to add a little fun and excitement to their lives...but where to find it? BINGO! Jeanne Michels and Phyllis Murphy's The Queen of Bingo explores the worlds of Bingo, family ties, diet crazes, widowhood, hot flashes and winning! 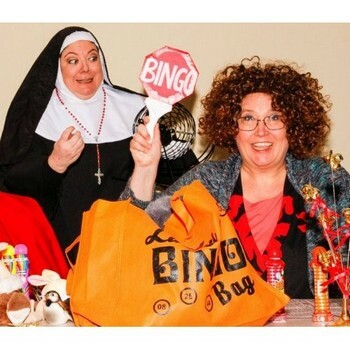 Theatregoers young and old will howl with laughter as two zany gals light up the stage in the comedy hit The Queen of Bingo! The Pizzeria La Sorrentina food truck will be in the Beacock Music parking lot on Sunday, May 5th from 12:00pm-5:00pm today! 10% of the sales will go to the Mt. View Instrumental Music Boosters! Sunday, May 5th at 2:00pm- The Pizzeria La Sorrentina food truck will be in the Beacock Music parking lot from 12:00pm-5:00pm today! 10% of the sales will go to the Mt. View Instrumental Music Boosters!